The irony of cultural imperialism. The clever comment that “you can tell the ideas of a nation by it’s advertisements” resonates with Americans, and conveys the flavor of self-criticism that characterizes American culture. But its ethnocentrism is reflected in the actual advertisements in the third world. In Ghana, “Own some shares today,” becomes an effort to deny the grinding poverty that makes it impossible for 95% of the population to even aspire to such ownership. In Guatemala, the advertisements for Orange Crush and Pepsi Cola reflect the empty calories, imported from America, that contribute to the desperation of an impoverished country. the Third World… the advertisements reflect the ideas of…America. An interesting and complex irony is captured in this photograph: a message sent not only through the placement of words in a sentence but a metamessage communicated by where the words appear. Advertisements have meaning and “work” because they incorporate and transmit culturally constructed ideas encoded through messages that sell. Had Ben Franklin lived in the advertising age he might have produced this layered aphorism, quintessentially American, celebrating marketing of its own ingenuity as a national product. The additionality complexity here is that the advertising statement appears to be selling the space for an advertisement. The statement itself sends a message to an audience that understands taken-for-granted cultural ideas about creativity, patriotism, and success. But what adds additional complexity is the type of space on which the statement appears – an out-of-use movie theater marquee. For more than a third of the nation’s history movie theaters were places for people to go to escape from the worries of everyday life, places where people spent their money and their time. The American experience of the last 25 years has been a process of corporate globalization resulting in a major shift in the mode of subsistence from a manufacturing economy to a postindustrial one. American-based factories have closed and work moved not just out of American cities, but out of the United States. Former “company towns” have become “ghost towns.” This advertising for advertisements on the marquee of an abandoned theater sends a metamessage about American experience in the age of globalization. On this picture one can observe the timeless phrase “you can tell the ideas of a nation by its advertisements”. This notion is true and one can see it by exploring the different types of advertisements and the ways they have changed over time. Advertisements perfectly reflect a society as they present its cultural norms, ideas on family, race, gender and consuming. First of all, the advertisements of the past are characterised by racism and sexism. During the first 50 years of the 20th century and even later than this, it was socially acceptable to consider females and ethnic minorities as inferior. Back then, these two categories had a diminished amount of rights than the rest of the population and this was obvious through the media of the times. If we look at posters from that point of history when it comes to women we will see the usage of phrases such as “even a woman can open it”, for a ketchup can ad. “Keep her where she belongs” for a shoe ad. “It is always nice to have a girl around” for another shoe ad and more. This could sound ridiculous to us but it was a reality for women back then. They were considered weak, insecure, and totally depended on their male partners. This occurred because males were the only ones providing their families with an income as females had no rights in the working area and no political rights either. Their main job was to keep the household and take care of their kids and partners. When it comes to ethnic minorities, one can observe many disturbing ads as well. Posters back then used to present African Americans mostly as servants to the whites. For example posters of “Aunt Vermina” show an African American lady as the servant of a house where a white family lives. Also, a poster from “Pearls soap” showed the image of a white kid washing an African American kid with this soap. After the bath the kid turned white, showing how "good" the soap cleans. It sounds irrational and offensive to us but then things were different as the societal norms had doomed minorities in leaving with zero respect in multiple levels. Nowadays with the existence of laws, regulations and restrictions, ads are politically correct. This happened as anti racism and feminism raised as ideologies and promoted equality. So, what can we see through the advertisements of our days? First we can observe the ideas of beauty both for males and females. Curvy, long haired females and muscular men are in every single beauty product ad showing the socially acceptable beauty image. Another fact is the perfect family. In adverts for family products one can rarely see gay couples or single parent families. This occurs as the nuclear type is the societal idea of what family is. Last but not least, the obsession for consuming is also clear. During Christmas, black Friday and sales the public gets bombed by advertisements of useless products. This shows how addicted to consuming population is in our times. This US Sign “You can tell the ideas of a nation by its advertisement” is a powerful image in several ways, and it is the power of the message that must have struck the curiosity of Rachel Turner. Firstly, advertisement is a form of popular culture in the sense that it spreads wide and the ad creators not only have to find the right channels to air/broadcast their messages for wider audiences, they also have to craft the message in a manner that is truly powerful—especially at the level of aesthetics. This is how their messages can disseminate disseminate fare and wide (Zemon-Davis, 1992, Lawrence Levine, 1977). However, we also have to appreciate the fact that for an advert to travel wide and resonate with its intended audience, the creator of the ad has to be, among other things, an accurate observer of the society so as the rhyme with the pulse of the people. Ads do not thrive in vacuum. They are socially constructed. In this context, the creator relies on the ideas already existent in the community so that the ad does not seem out of place. This therefore means, the ad carries within it ideas of the community. Indeed, an ad then becomes a powerful source of material for academic and historical inquiry. It is like comedy or tragedy drama (or any other piece of creative thinking): what constitutes a joke or tragedian sensibility is often context specific. Playwright Wole Soyinka (1976) tells a story of a Nigerian tragic play “Song of Goat,” which was highly acclaimed in Nigeria as a tragedy but flopped on the London stage its appeal of tragedy (male infertility) did not constitute tragedy in London. This was especially because the country developed technological and social remedies for infertility. This then means that through items such as ads, dramas, and other creative compositions, one can tell the ideas of a nation. However, we need to appreciate the business side of an advert. The need to sell and appeal. Ads therefore tend to embellish, to exaggerate in their enthusiasm to attract buyers. What is also true is that even these exaggerations can only be from what the ideas of the community appreciate. Globalisation has made ads cross territories into other communities, but the success of a cross-border ad only comes after the intended audience has developed ideas that resonate with the ad. In saying this, I am also aware about the ways in which advertisement can bring to life new sensibilities, to the point that an entire community is altered through rigorous capitalist advertisement. The example is Timothy Burke (1996) study in Zimbabwe about how notions of cleanliness and hygiene changed following the rigorous ads of soaps (lifebuoy and lux). Ads here created a new worldview, of cleanliness as a way of thinking about modernity. 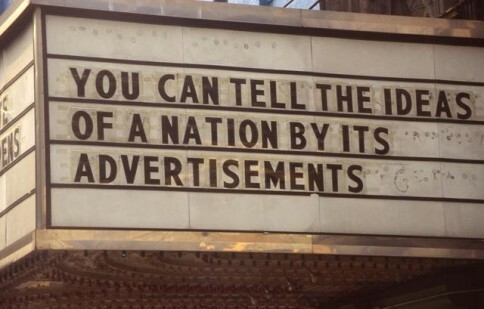 More like : You can tell the ideals of a nation by its advertising. A nation is a constructed entity; you can tell the ideas of a nation by its advertising but not the ideas of its people. In America advertisements teach us about ideal citizenship: you must be thin, rich, straight, white, happy, able-bodied. Advertisements present an unattainable life. These are the values of many, but not all. Look outside the frame of the image, in the America of unrepresented lives, and you see forms of love that are almost never used to sell jeans: sacrifices made for children, gay desire and family, real community, love of god, and the most radical of all: love of self, without all the things the adverts tell you you need. In a predominantly capitalist nation like America, advertisement produces need for commodities to ensure the production of profit. To make profit people must believe they need things which they do not; they must adhere to the rules of excess in order for excess to continue to circulate, maintaining and intensifying the darling of capitalism: inequality. In a socialist system like that of Mao or Stalin, where the marriage of economics and politics takes on a different form, there need only be one kind of advertisement - that promoting the party, the great leader and the system- selling the nation to its people so that they continue to make their worlds in its image. The image of the great leader doesn’t sell something material, yet it advertises; interpellating a public to have their hearts and minds sold in exchange for inclusion in the system. Guy Debord writes, “Every new lie of advertising is also an avowal of the previous lie. The fall of every figure with totalitarian power reveals the illusory community which had approved him unanimously, and which had been nothing more than an agglomeration of solitudes without illusions” (Debord: 1983: 70). Advertisements tell us what ideas get sold to the masses, making their way around and around, seemingly uncontrolled like a swing at a carnival. You’re sure you’re going to fly off. In this image, the text is written on a marquee outside a theatre, whether movie or otherwise. The style itself refers us to the system at hand: the cinematic, the ideals of a 1950s Hollywood, real or imagined- glamorous, decadent. The America revealed is one with ideals of celebrity culture rather than ideals of the real, the ordinary, the poor. The sign itself is a kind of advertisement for the show inside. It presents us with the trap that images- which advertisements always are- produce; we cannot unsee them, nor can we know the world we live in without their influence. The world is imaged for us, imagined through the pictures we consume rather than the dreams we produce. Our dream worlds are not our own, but, we imagine, our reality is. Debord, Guy. 1982. Society of the Spectacle. Detroit: Black and Red.